Is it a plant or an insect? Believe it or not, those wierd objects in the picture above (courtesy of www.sowtheseed.rg.uk) are the start of our Kitchen Garden, and, strange but true, like the Ugly Duckling from the Hans Christian Andersen story, these straggly, string-like objects evolve into the most amazing succulent and tasty Asparagus Spears. So on one of the coldest weeks in living memory, with wild gusts of snow from the North Sea flying past my office window, I took the plunge and ordered my Asparagus Crowns from one of our trusted Merchants, Thompson & Morgan. Because I am creating my Asparagus bed from scratch (for the 3rd time), and have plenty of room in this new garden, I decided to order the Thompson & Morgan Spring Planting Collection B. which should give me lots of juicy Asparagus and a long cropping season (from early May into Mid-June). Not a long season, as crops go, but enough to eat in every which way, and to freeze lots of soup etc. This collection comprises of ‘Ariane’, and early variety with an ‘impressive’ yield. ‘Mondeo’, strong growing with thick spears, ‘Pacific 2000’, tender green spears and ‘Pacific Purple’, very sweet, stringless and tender (and it really is purple as it shoots up out of the soil). I was going to order my Asparagus from Sarah Raven, but she sends out the crowns in March, a bit too early for me, so when I noticed that the Thompson & Morgan Asparagus would be delivered to me in April, I opted for their collection. We are going to make raised beds, the Asparagus Bed obviously being the first. 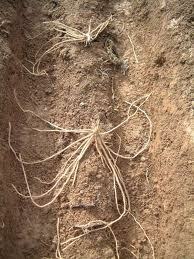 When the very delicate Asparagus crowns are delivered, they need to be planted as soon as possible. I am going to use thick cardboard, laid down on the grass, then gradually tip compost and top soil on top of it. Erik will construct the raised bed around this, and as the planks get higher, I will add some light grit and top-soil. We will have to get a move on, to be ready for our precious delivery of the Asparagus Crowns. The weather isn’t helping (it’s snowing again as I type this), but nil desperandum, our bed will be ready. I am thrilled that, at long last, our Kitchen Garden begins. So much to do, so much to look forward to. 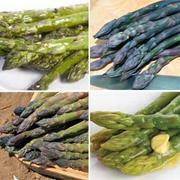 When I prepare the bed, I will take photos and write a sort of ‘step by step’ creating an Asparagus bed. Keep watching this space. Our Computer friend, Katrina, is going use her skills to help us update our blog. So sharingourfoodadventures.com may not be available for a short time, but when it is finished, it should be even better. I, for one, can’t wait! Food Adventures – a new beginning! Loving the blog ,especially as I can picture you getting stuck into the kitchen garden now!